Easter is a time of celebrations and family get-togethers. Food is a huge part of the festivities, with many recipes dating back hundreds of years; find out more about the Easter recipes and culinary traditions celebrated around the world. For Christian countries around the world, Easter is one of the most important religious holidays of the year. The death and subsequent resurrection of Jesus is marked by traditions and festivities that are passed on from generation to generation. A number of these traditions can be found in all Christian countries, such as decorating and making chocolate eggs, but there are many others. 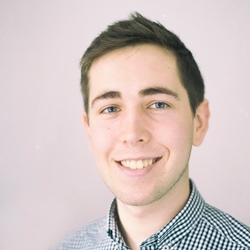 For example, in the UK we celebrate Easter with hot cross buns and simnel cake, but those are customs relatively unique to Britain. Learn what people around the world eat during Easter and bring some of their traditions into your own home. Easter in Russia is celebrated according to the Julian calendar – the old Roman calendar still observed by most Orthodox Churches – and typically falls about two weeks after Easter Sunday in Western Europe. The night before Easter, churches across Russia hold solemn night time services that can run well into Sunday morning. On Easter Sunday it is common to hear the phrase ‘Khristos voskres!’ (Christ is risen! ), with the response ‘Voistinu voskres!’ (Truly he has risen!). This may be followed by a triple kiss of peace, the traditional Russian greeting on Easter day. The rich, panettone-like bread Kulich is one of the most traditional Russian Easter dishes and is taken to the church to be blessed by the priest after the service. It is then cut into slices and enjoyed throughout the day, often with a slice of Pashka – a sweet cheesecake-like dessert made from cottage cheese, dried fruits and other ingredients that are forbidden during lent. 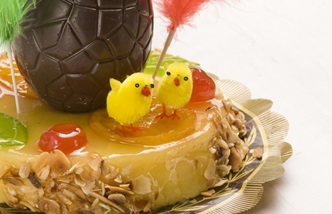 In Catalonia, godfathers take beautiful cakes adorned with feathers called La Mona de Pasqua to their godsons and goddaughters on Easter Monday. This traditional cake dates back to the fifteenth century and was originally topped with boiled eggs to represent the age of the child (up until their first communion). Nowadays, chocolate eggs are used instead along with brightly coloured feathers, yellow chicks and glacé fruit. Bakeries and cake shops compete to make the most impressive and complex cakes, which are then featured in local newspapers. Eggs are common feature of Spanish Easter dishes, as they were traditionally forbidden during lent. Rather than throw them away, freshly laid eggs were hard boiled to preserve them and then feasted on during Easter. The savoury meat and egg pie called hornazo is a typical example of this; eaten in the provinces of Salamanca and Ávila, it also has a sweet counterpart made from almonds, sugar, aniseed and egg. Easter is one of the most important holidays in Italy, with each region celebrating the event in its own unique way. In Florence it is celebrated with the Scoppio del Carro (Explosion of the Cart), where a large wooden cart is dragged into the middle of the city’s old square and becomes the centre point for a spectacular fireworks display. Easter is a fantastic time to visit Italy, if only to see one of the grand processions held in towns and cities throughout the country. In Enna, Sicily, 2,000 friars take part in a mournful torchlight parade on Good Friday, wearing symbolic hooded robes and carrying ancient statues. Easter Sunday signals the end of the somber processions of holy week and the beginning of joyous celebrations and feasting. Torta pasqualina (spinach and ricotta pie) is a particular Easter favourite and features whole eggs that are baked inside the pie to give it its distinctive appearance. For dessert, a fragrant wheat tart called Pastiera napolitana is enjoyed in Naples, while in Sicily a rich, liqueur-soaked sponge cake called Cassata is favoured. Food is a vital part of Cypriot culture, and traditional dishes are just another way for the people to join in the festivities. Orthodox Greek and Muslim Turkish Cypriots share the tradition of eating flaouna bread for religious holidays, which explains why it is also known as Easter or Ramadan bread. This cheese and mint stuffed bread is typically eaten at breakfast with a strong cup of coffee, often accompanied by olives, cheese and tomatoes. Try making your own for a nice alternative to other Easter breads – Karen Burns-Booths’ authentic recipe has helpful suggestions for substituting ingredients that are hard to find outside of Cyprus. Easter is more of a secular celebration in Sweden, but there are still many traditions that are observed. One of the more unusual Swedish traditions called Påskkärringar occurs the day before Easter Sunday and sees children dress up as Easter witches in old raggedy clothes. They then walk around in groups around their neighbourhood, asking for sweets in exchange for their homemade paintings. Easter Sunday is commonly celebrated with a feasting table of eggs, pickled herring and in some households roast lamb. 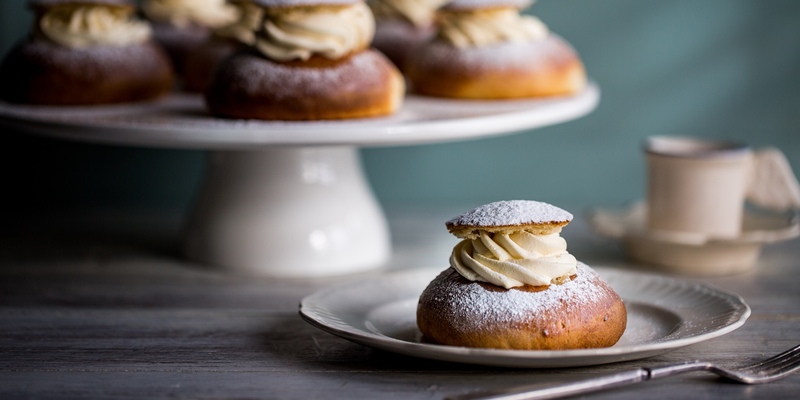 The delicious almond- and cream-filled semla bun is perhaps the most iconic Swedish sweet during this period. As with the Catalonian Easter Mona cake, there is a great deal of interest over which bakery produces the best semla bun. Brazil has the largest Catholic population in the world, making the Easter period a very important time of year. Due to its geographical location Easter falls in the autumn for Brazil and is marked by processions, carnivals and other open-air events. One of the most popular events is a passion play by volunteers in the village Fazenda, regularly attracting thousands of tourists. Although each Brazilian region has a distinct style of cooking, there are a number of Easter foods that are enjoyed throughout the country. A delicious crumbly peanut sweet called paçoca is traditionally eaten on Good Friday, while bacalhau (salt cod) dishes are a staple on Easter Sunday.